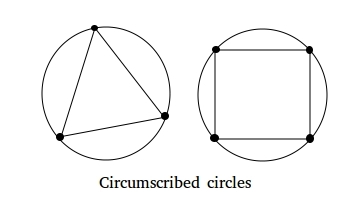 In this lesson, we show what inscribed and circumscribed circles are using a triangle and a square. 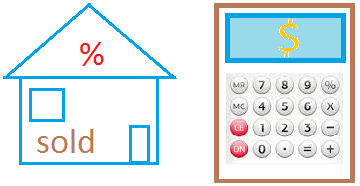 Circles can be placed inside a polygon or outside a polygon. When a circle is placed inside a polygon, we say that the circle is inscribed in the polygon. Two examples of circles inscribed in a triangle and a square are show below. Notice how each side of the triangle is tangent to the circle at exactly one point. By the same token, each side of the square is tangent to the circle at exactly one point. Notice also that there are 3 points of tangency for the triangle since there are 3 sides and 4 points of tangency for the square since there are 4 sides. When a circle is inscribed in a polygon with n sides, there will be n points of tangency. When a circle is placed outside a polygon and each vertex of the polygon lies on the circle, we say that the circle is circumscribed about the polygon. 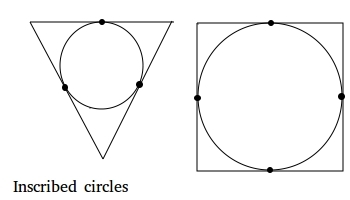 Two examples of circles circumscribed about a triangle and about a square are shown below. Notice how each vertex of the triangle or the circle lies on the circle. Notice also that there are 3 points that lie on the circle for the triangle since there are 3 vertices for the triangle.